Inside Reinventing Reality, visitors will learn about how perception, displays, digital models, tracking and engineering bring virtual and augmented reality to life. Utilizing the latest VR technology, visitors can virtually create, compete, and explore with other visitors. Hands-on, inquiry-based exhibits encourage visitors to experiment with electronics, software, and perceptual illusions to discover the surprising science and technology behind virtual reality. The computer maintains models of objects that it displays, for as many of our senses as technology allows. Dive into a fully immersive VR experience. The computer sees and manipulates a virtual world of digital objects. Step into a compelling and visceral virtual environment. Our brains construct our experience of reality from a surprisingly small set of sensory cues. Exhibit visualizations by Quatrefoil Associates, Inc.
With this exhibition, Virtual Science Center is fulfilling the current need for more high-quality traveling science exhibits. We are using this immersive and exciting technology to deliver a high-impact blockbuster exhibit that will increase museum attendance and promote STEM learning in middle school students and families. Do you have Virtual and Augmented Reality experiences in your museum, but want your visitors to dive deeper and learn more about how it works? 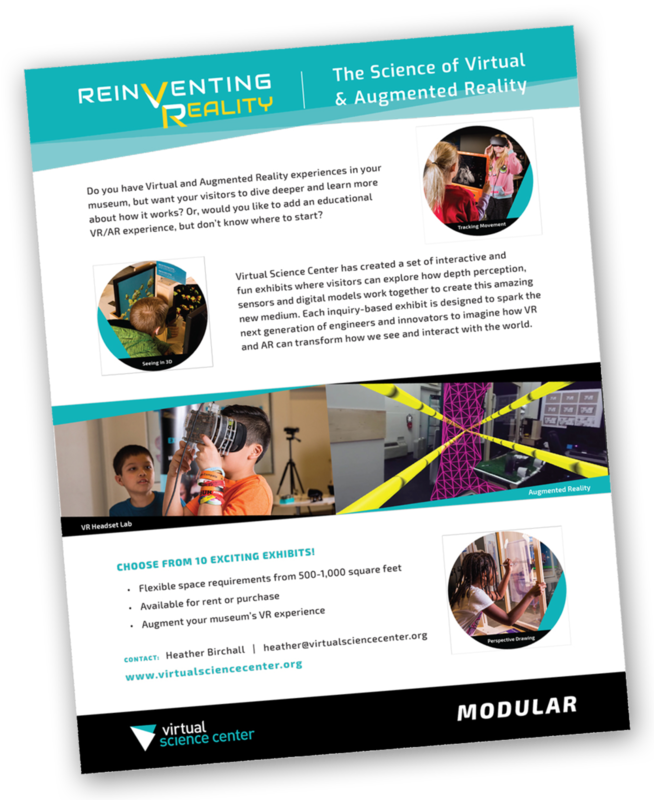 Or, would you like to add an educational VR/AR experience, but don’t know where to start? Download our PDF for more information on our modular exhibits.